Brother Edwin Q. Cannon Jr., we call him Ted, was a missionary to Germany in 1938. He loved the people and served faithfully. 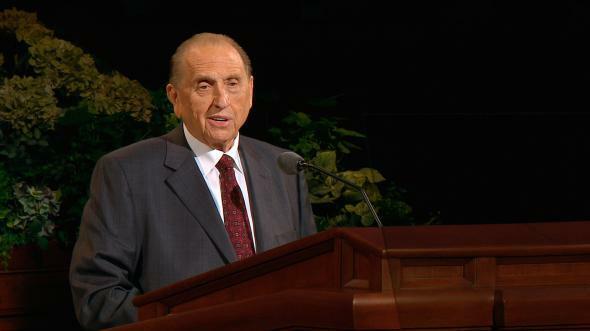 At the conclusion of his mission, he returned home to Salt Lake City. He married and commenced his own business. Forty years passed by. One day Brother Cannon came to my office and said he had been pruning his missionary photographs. (That’s a good word. You go through all of them, throw two away, and keep all rest.) Among those photographs he had kept since his mission were several which he could not specifically identify. Every time he had planned to discard them, he had been impressed to keep them, although he was at a loss as to why. They were photographs taken by Brother Cannon during his mission when he served in Stettin, Germany, and were of a family—a mother, a father, a small girl, and a small boy. He knew their surname was Berndt but could remember nothing more about them. He indicated that he understood there was a Berndt who was a Church leader in Germany, and he thought, although the possibility was remote, that this Berndt might have some connection with the Berndts who had lived in Stettin and who were depicted in the photographs. Before disposing of the photos, he thought he would check with me. I told Brother Cannon I was leaving shortly for Berlin, where I anticipated that I would see Dieter Berndt, the Church leader, and that I would show the photographs to him to see if there was any relationship and if he wanted them. There was a possibility I would also see Brother Berndt’s sister, who was married to Dietmar Matern, a stake president in Hamburg. Wiping away my own tears, I told Brother Berndt the photographs were his. He placed them carefully and lovingly in his briefcase. At the next general conference, when Dieter Berndt visited Salt Lake City, he paid a visit to Brother and Sister Edwin Cannon Jr. so that he might express in person his gratitude for the inspiration that came to Brother Cannon to retain these precious photographs and for the fact that he followed that inspiration in keeping them for 40 years.